FEA-TC offers a full line of SOLIDWORKS Simulation (FEA, CFD) training courses to support all our users at every level. 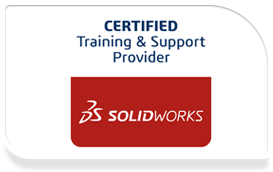 As an authorized SOLIDWORKS Training and support center, FEA Training Consultants Inc. is able to offer professional training taught by a team of award winning certified instructors. Our Toronto based training and support centre serves the Ontario area. Call us today about our upcoming training courses for SOLIDWORKS Simulation software. Learn the entire process from meshing to evaluation of results for parts and assemblies. It discusses linear stress analysis covering the entire analysis process from meshing to evaluation of results for parts and assemblies, gap/contact analysis, and best practices. Learn how to deal with models that exhibit large displacements and/or yielding, discuss and practice the use of many material models available in SOLIDWORKS Simulation and, most importantly, how to drive a non-linear analysis to successful completion. Raise your FEA skills to next level! The first part of the course will teach you the basic and advanced topics in non-linear stress analysis.The second part of the course will expose you to various advanced topics in Dynamics. Learn how to use the SOLIDWORKS Motion simulation package to study the kinematics and dynamic behavior of your SOLIDWORKS assembly models.